Thanks to digital technologies the written word is more widespread than ever, but how much is really being said? Is cheap (or free) content pricing the truly-talented out of the market? Or is the spark of literary genius too bright to be extinguished by some measly little internet? If you’ve ever pondered such matters, we’ve got the event for you. This Sunday, October 14th, from 5:30-7:00, the Whistler Museum will host the first installment of our new event series Whistler Debates. Produced in partnership with our friends over at WhistlerIsAwesome.com, Whistler Debates events will feature articulate and opinionated guests engaging in respectful, informed dialogue on wide-ranging topics of local or general interest. The debates will take place year-round and usually coincide with ongoing festivals and events. 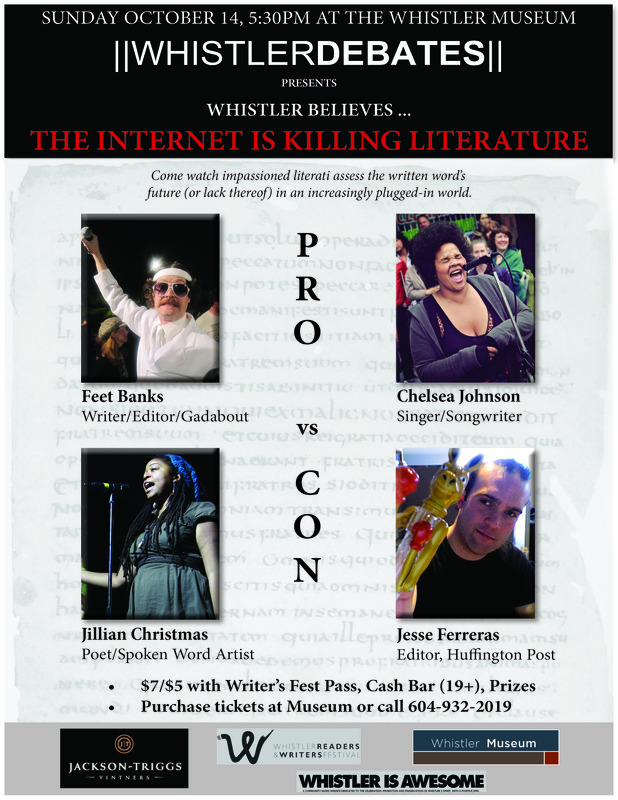 Our first installment coincides with this weekend’s Whistler Readers & Writers Festival, and we will be debating the statement “Whistler believes… The internet is killing literature.” On the “Yea” side we have local writer, editor, mc, and all-around s$*#-disturber Feet Banks, and Vancouver-based singer/songwriter Chelsea Johnson. Arguing “Nay” are Jillian Christmas, acclaimed poet & spoken word artist, and Jesse Ferreras, formerly of Pique Newsmagazine fame and currently an associate editor with the Huffington Post. Entry to this great event is just $7 ($5 for those with Writer’s Festival passes), and can be purchased here at the museum (4333 Main Street) or by calling us at (604) 932-2019. After the debate make sure to head on over to Maxx Fish, for the Writer’s Fest’s final event, Whistler’s 7th installment of Pecha Kucha, where Chelsea and Jillian will once again feature on a very exciting bill of presenters. We’ve also got more debates coming in the near future, starting with the “Preservation vs. Pow” debate on backcountry access, taking place at Millennium Place on October 29th. Stay tuned for more details on this and future Whistler Debates events coming shortly! This entry was posted in News & Events and tagged Books, debate, literature, Whistler, writers festical. Bookmark the permalink.